Feeling Fruity? Como Setsuko Made this super cute ruffle dress called Sia, I loved the pineapple print on this version it also has a shirt only option, I wanted to play around with a couple of looks with them <3Hope you all had a wonderful weekend. Summers finally creeping up on us….. Larger ImageThe recent gorgeous weather in London Got me in the mood to make a summer post, and latest releases from Lelutka came just at the right time drag me out my blogging break, The sculpt work and Textures in this collection I believe to be the best clothing release ever from Lelutka the sculpts don't look stiff and the colors and textures are amazing. Another Love is the new Agness ostrich bag from kookie again the little details on this bag make it Perfect and its the Just the type of bag I would carry around with me rl. 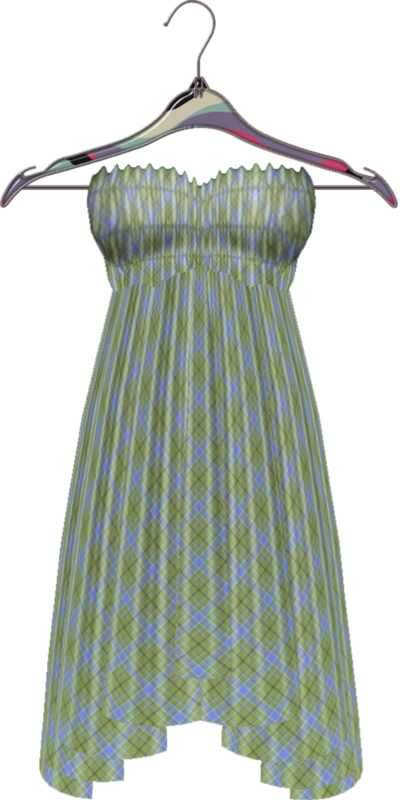 Left in a daze by summer days, Dayz is a perfect, light weight summer dress for in SL. The tube top is smocked to cling, while the skirt has an uneven, handkerchief type cut. Available in 5 soft colored plaids, as well as a more intense RFL color. Stop by and check out our new store and great recent releases! RFL Color! Other Colors! Keiko Has been hard at work for past few months working on a new skin line, we saw a glimpse of the new face with the opening of Trilogy where she had three Themed Skins out of for sale. But Hounds Of Love which is the new name inspired by a Kate Bush song, as are most of Keikos items names inspired by her.The Skin has been tweaked and tweaked and tweaked and is being released very very shortly so please join &bean group for further updates. My deepest apologies if you visited [Pink Fuel] earlier to only find no Project Themeory item. I originally withdrew from participating this week because of RL but there was a minor miscommunication error between myself and the organizers and I was listed as a participant this week even though I had nothing prepared. I put all the blame on myself and not the organizers for this error. The Project Themeory organizers do a great job of keeping everything running and coming up with interesting themes. Ive been itching to do this post for a little while now, but having a pc melt down last week caused me to lose alot of recent work on my hard drive Booo! However it didn't stop me from going back and re doing the pictures I took For Ikis Latest skin keira.Keira comes with an impressive 15 make ups as well as freckles and cleavage options. With Keira you have the options of buying Black, Blonde And wait for it Red brow options.All skins also come with Hairbases and for for sl2.0 users a tatoo layer hairbase. Keira retails for 1000 L$ for a single (all options) skin, and a fatpack of all make ups is really great value at 7500 L$. for 15 makeup options! If you have happened to bump into me in sl over the last couple of days you would of seen me sporting a red hair which i have never done in sl but Keira is so so stunning in the red brow option makes a nice change.